shine brite zamorano: building with frank. 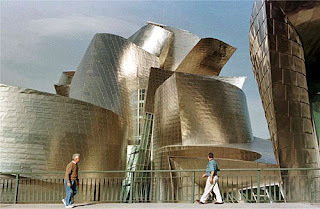 Frank Gehry's architecture pushes the boundaries of what buildings are "supposed" to look like. The natural curves, folds, twists, and turns make his buildings look like they are moving in the wind. Made of various metals and reinforced concrete, these landmarks aren't going anywhere, but they allow your imagination to take flight with their apparent lightness. I've used his work to allow students to experiment with actual texture and 3d natural looking shapes in art. Students make 3d paper and aluminum foil architectural collages placed in a hand drawn setting. Students are required to add at least 3 natural looking shapes to the foil main building. These pieces are made of foil glued to paper and then cut out. This provides enough support and stability to these 3d pieces.